Not to encourage anyone out there to have as many energy drinks as we do in the office (we know that they are definitely not the healthiest choice), but we thought it would be worthwhile to show you what the Energy Drink Fridge at the office looks like. That’s right, we said “Energy Drink Fridge”. To take this to yet another level, why not take our Energy Drink Survey Below? 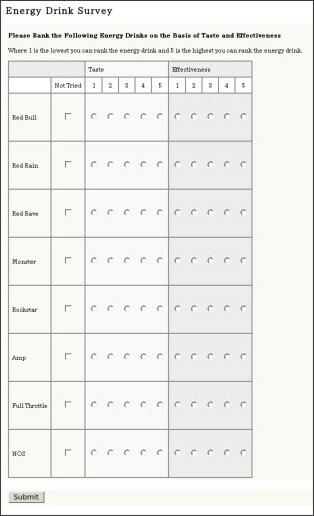 We’re not sure, but we might add an energy survey template to our new survey templates page. What do you think? I love energy drinks i drink them about twice a week most of the time and i normally get health ones from the health fair that are based on acai and stuff like that but sometimes i like to get a full throttle or a venom but im 15 and my metabolism is way below what it should be but other that that im healthy i eat organic and it seems that i can drink as many energy drinks as i want but i only get a little energy and if i drink like 5 i start getting tired so its kinda weird.